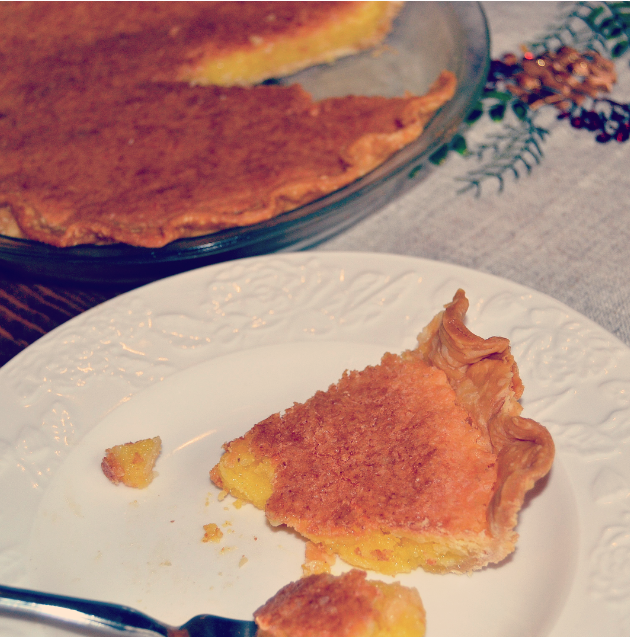 Before I married my husband six years ago this week, I had never really heard of chess pie. Ever since our first Thanksgiving together, it has been my mission to conquer the difficult art of his favorite childhood dessert: chess pie. 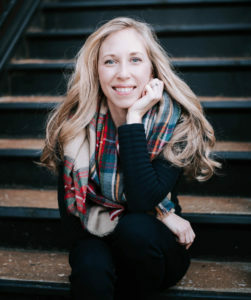 The women in Wade’s family who whip out beautiful and delicious desserts faster than you can say “snickerdoodle” would never say that a chess pie is difficult (for them). However, after my many unsuccessful attempts to get the pie to congeal and set appropriately, I know this to be so. 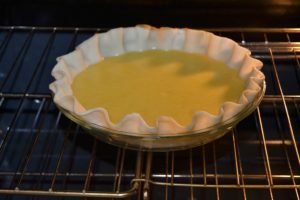 I believe the secret is in the cornmeal… Which, after all, is the ingredient that makes a chess pie a chess and not a custard pie. Where did the name “chess” come from? I read somewhere several years ago as I scoured and attempted at least 20 recipes that the name comes from the term “pie chest,” which is what some people call pie safes. Ironically, the man who first introduced me to the simply-sweet tasting dessert is the same man who surprised me with the most beautiful pie safe I’ve ever seen for our first wedding anniversary. 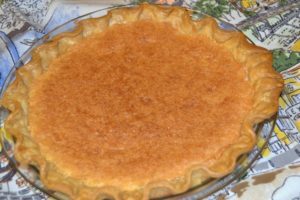 I feel like chess pie is one of those desserts that a pioneer could whip right up and then stash in her pie safe away from the eight children and wild animals. No fancy KitchenAid Mixer or pastry tool needed….just a spoon, a bowl, some measuring trinkets and a hot oven. I made my pie while listening to a great Christmas Pandora mix and texted Aunt Laura… not exactly my most primitive moment, but I did channel my hero Jenny Wiley for a couple seconds. 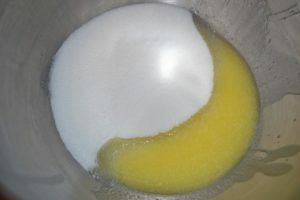 Start by adding sugar to melted butter. 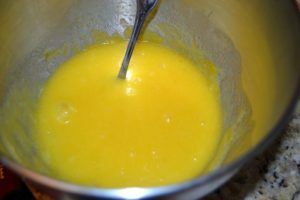 Add slightly beaten eggs and stir. Add remaining ingredients and stir. (Note for the vinegar, either white or apple cider may be used, but AC gives a nice hint of flavor). Pour into prepared pie shell (always grease a pie dish before adding shell) and bake in the middle of the oven. Remove after approximately 45 minutes. Pie needs to cool completely before serving. I recommend baking the day before and serving cold, but some people prefer room temp. Happy baking! 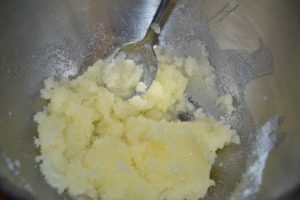 Melt the butter, add the sugar and stir. 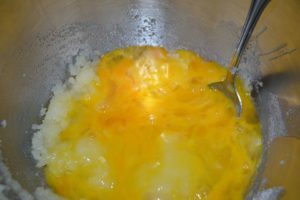 Add eggs, stir. Add cornmeal and vinegar, stir. Add to pie shell. Bake approximately 45 minutes.